Student readers gathered in the bleachers. Dylan Holcomb with orange scarf. 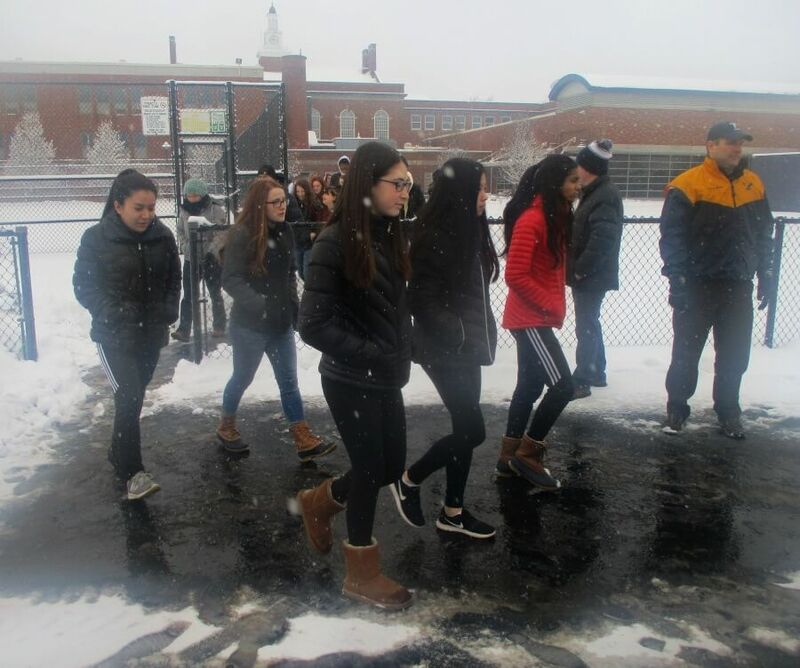 Trudging through the late winter snowfall and huddling on the frozen football field was a token price for the honor of listening to seventeen Brighton High School students pay respects to the seventeen Parkland shooting victims. Before a gathering of about 600 students who had joined the National School Walkout, students read brief statements about each Parkland victim. 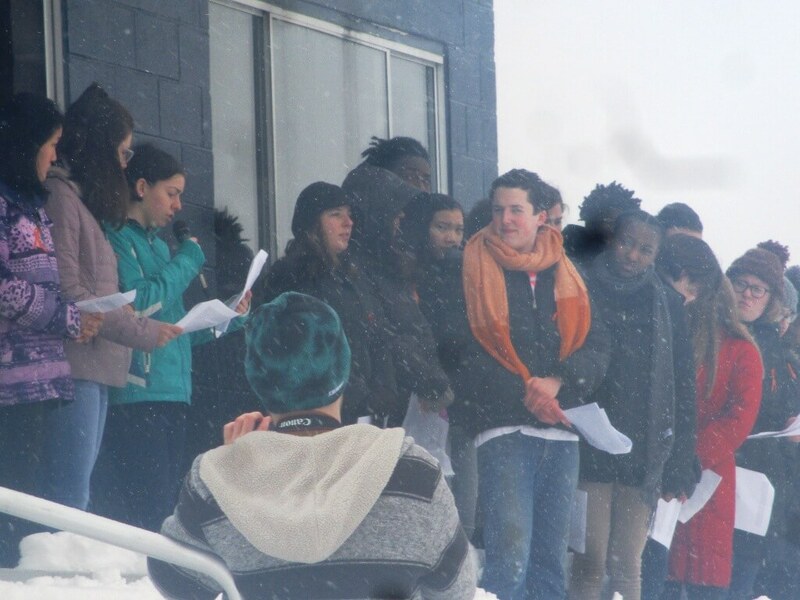 Other students gave inspirational speeches, ranging from general calls for unity in the face of gun violence to specific and pointed proposals: taking Donald Trump to task for towing the NRA’s line, banning assault weapons and reinterpreting the 2nd Amendment. As a BHS alum, I was especially proud as the current generation demonstrated its commitment to urgently needed change, civil debate and non-violent protest. Hundreds of BHS students joined the National Walk Out. Let us not limit this narrative to the innocent suburban victim, but let us keep in mind all of those lost due to racist, homophobic, terroristic, and domestic gun violence. Dylan’s memorable line struck such a moving chord that the opening phrase became the front page headline in today’s Democrat and Chronicle. Again and again, speakers emphasized the event was meant to be more than an isolated memorial to slain students in suburban Florida. It was about gun violence plaguing neighborhoods and some urban schools, about the mass shooting in a gay night club in Orlando or the massacre by a white supremacist in a South Carolina church. Leaving the school a few minutes before 10am as did thousands of hundreds of thousand of students, teachers and staff around the country. Gathering on the football field in respectful silence. Principal Tom Hall clearing snow before students arrived. It was about the coming together of a generation, the “Generation Columbine” — those born after 1999 who only know a world with school shootings. And one making its voice heard. 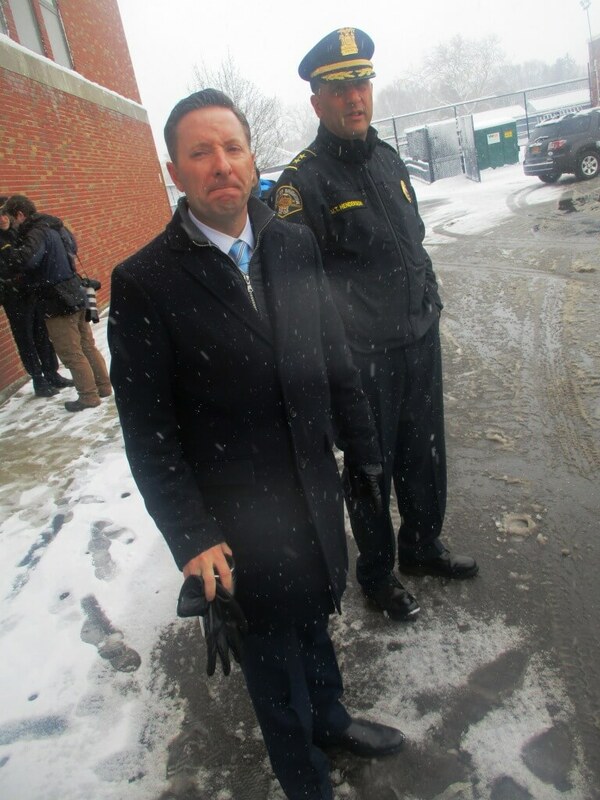 Superintendent Kevin McGowan with Brighton Police Chief Mark Henderson. I also appreciated the strong support of the school administration as those voices were heard. In some schools across the nation, students who walked out faced detention or suspensions, the event treated as an act of civil disobedience. 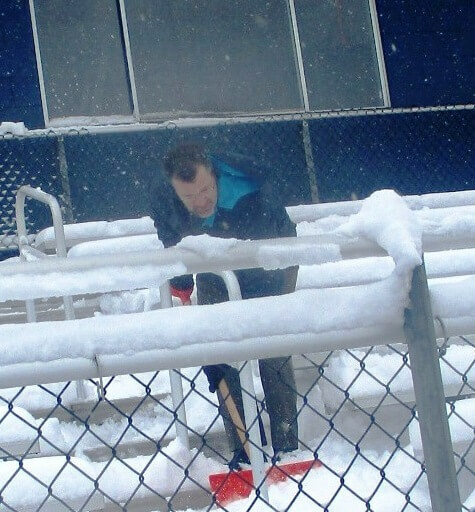 Yesterday, Principal Tom Hall was leading the shovel brigade as students trickled into the bleachers. These kids are incredible. They speak more eloquently, thoughtfully, passionately than many adults do on these topics. I could not be more of the leadership. I think we all could take a page out of their book and learn quite a bit. He was right. hearing the voices was well worth trudging through the snow. Watching Generation Columbine in action, I reflected on my own experience at BHS when we lived under the threat of nuclear warfare. I was too young for “Duck and Cover” but knew the school had contingency plans for a nuclear attack. In social studies, we learned about nuclear winter and how humans would not survive an atomic apocalypse. In A.P. English we watched Dr. Strangelove. In the school library, I read On the Beach about the last days of civilization in Australia following nuclear Armageddon. As fearful was the threat, it somehow felt abstract. 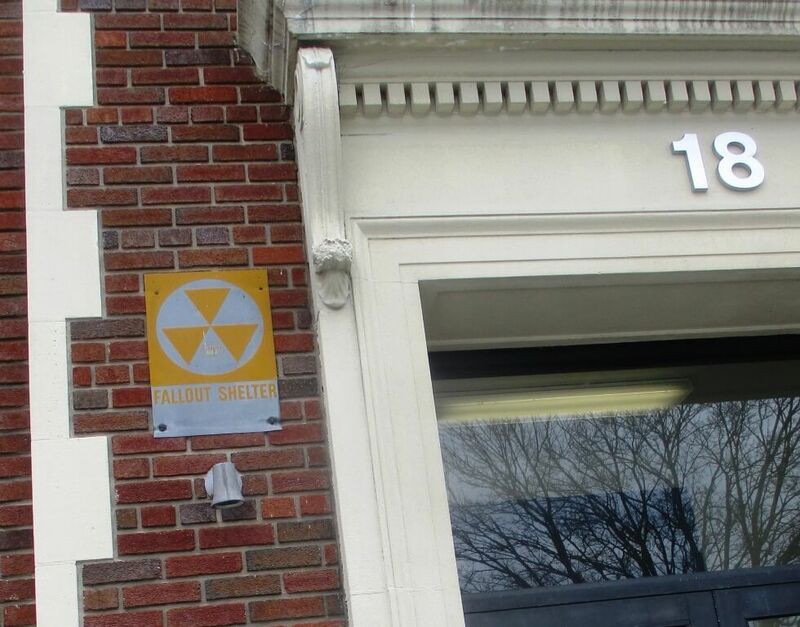 Fallout Shelter sign on the Twelve Corners Middle School in Brighton. Technically, the school is still a shelter with a capacity of 225. I talked with Dylan about the fears faced by Generation Columbine. Though not as cataclysmic as nuclear war, school shootings are visceral and immediate; nightmares that can happen in an instant. Dylan said, especially for younger child, the emotions are not abstract. Although Dylan knows school shootings are rare, after Parkland he felt for the first time afraid to come to school. The shooting happened in Florida but Dylan felt it in his gut. And he started organizing so Generation Columbine can stop being called Generation Columbine.